Our meetings are held at 7pm on the first Monday of every month (with the exception of July & December. Currently we are meeting in downtown Carlisle at the Carlisle Arts Learning Center (CALC). CALC is located at: 38 W Pomfret St, Carlisle, PA 17013. Visitors are welcome at all meetings and we are always happy to accept new members. Check our Facebook Page for up-to-date meeting information. PLEASE NOTE: The July meeting is our annual YBC Members’ Picnic and the December meeting is our annual YBC Members’ Holiday Party which are both held at another location. 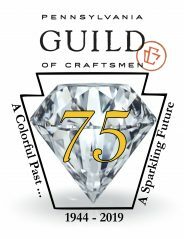 If you just joined the Pennsylvania Guild of Craftsmen or are new to the Yellow Breeches Chapter, please contact chapter Co-Presidents, Abria Donato and Leslie Halaby-Moore (ybc.pgc.president@gmail.com), for details on time, location, and what to bring.